When people call out Happy Holidays the going assumption is that they mean the celebratory events that fall between December and January. But, if you pull back just a bit, we’ve got so many other holidays pretty much lined up all together. Why start the festive season so late in the year when we can start it right up in the autumn when so many people are starting to get into the mood to really start up the party season!? It seems a little wild, perhaps, but we’ve had several family members who were itching to start some Christmas related decorations much earlier than the day after Thanksgiving. At first, we were a little resistant. Blurring the holidays together seemed a touch problematic. But, then again, Tim Burton did it in his stop motion musical and that was a smashing hit! So, gates are open! Holidays are meshed! Santa for Halloween and pumpkin pie for Christmas… well, that last one was already happening, anyway. Either way, there’s certainly something to be gained from bringing in a bit of North Pole elvish magic to mix with the thinning veil of All Hallows Eve. Extra magic never hurt anyone, eh? 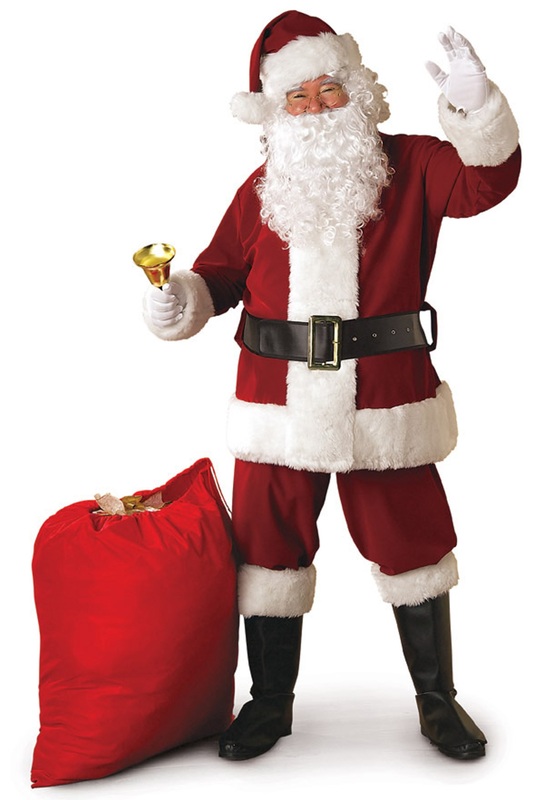 But, we still need someone to fill the big guy’s boots and you seem to be the perfect candidate to hop on the sleigh with this Regal Santa Suit. The bulk of the suit comes in the vivid burgundy jacket with pure white trim and matching pants with comfortable elastic waist—and pockets, of course, in case you need to stuff some sweets. The wide black belt is almost as iconic as the coat itself and matches well with the black boot covers. Complete the look with the oversized red Santa hat and get to practicing your jolly laughter! Next, let’s see which is faster: broomsticks or reindeer!